Replica of Harald Bluetooth’s rune stone in the permanent exhibition at Royal Jelling. Photo:Anne Pedersen. In December 2000 the exhibition centre Royal Jelling opened, containing a permanent exhibition about the royal monuments at Jelling. 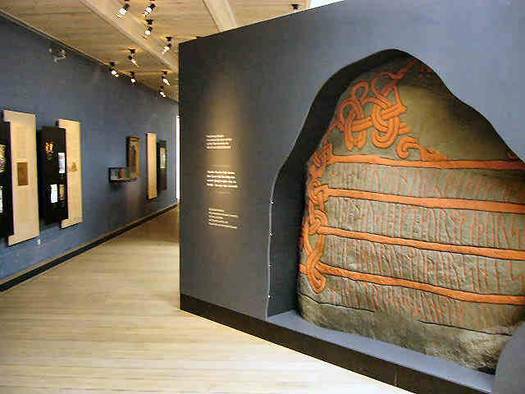 In the middle of the room stands a coloured copy of Harald Bluetooth’s large rune stone. Its inscription contains the key words of the story of Harald Bluetooth’s time, a story of tradition and innovation, magnificent structures, royal power and change of religion. The copy consists of three sides, separated out so as not to compete with the original rune stone outside in the churchyard. The three sides were exhibited by the National Museum in 1984, along with other experimental casts. Royal Jelling. Photo: The National Museum of Denmark.